This article is about the prokaryotic antiviral system. For for the use in editing genes, see CRISPR gene editing. CRISPR (/ˈkrɪspər/) (clustered regularly interspaced short palindromic repeats) is a family of DNA sequences found within the genomes of prokaryotic organisms such as bacteria and archaea. These sequences are derived from DNA fragments from viruses that have previously infected the prokaryote and are used to detect and destroy DNA from similar viruses during subsequent infections. Hence these sequences play a key role in the antiviral defense system of prokaryotes. The CRISPR-Cas system is a prokaryotic immune system that confers resistance to foreign genetic elements such as those present within plasmids and phages that provides a form of acquired immunity. RNA harboring the spacer sequence helps Cas (CRISPR-associated) proteins recognize and cut foreign pathogenic DNA. Other RNA-guided Cas proteins cut foreign RNA. CRISPR are found in approximately 50% of sequenced bacterial genomes and nearly 90% of sequenced archaea. The discovery of clustered DNA repeats occurred independently in three parts of the world. The first description of what would later be called CRISPR is from Osaka University researcher Yoshizumi Ishino and his colleagues in 1987. They accidentally cloned part of a CRISPR together with the iap gene, the target of interest. The organization of the repeats was unusual because repeated sequences are typically arranged consecutively along DNA. They studied the relation of “iap” to the bacterium E. coli. The function of the interrupted clustered repeats was not known at the time. At the same time, repeats were observed in the archaeal organisms of Haloferax and Haloarcula species, and their function was studied by Francisco Mojica at the University of Alicante in Spain. Although his hypothesis turned out to be wrong, Mojica’s supervisor surmised at the time that the clustered repeats had a role in correctly segregating replicated DNA into daughter cells during cell division because plasmids and chromosomes with identical repeat arrays could not coexist in Haloferax volcanii. Transcription of the interrupted repeats was also noted for the first time. By 2000, Mojica performed a survey of scientific literature and one of his students performed a search in published genomes with a program devised by himself. They identified interrupted repeats in 20 species of microbes as belonging to the same family. In 2001, Mojica and Ruud Jansen, who was searching for additional interrupted repeats, proposed the acronym CRISPR (Clustered Regularly Interspaced Short Palindromic Repeats) to alleviate the confusion stemming from the numerous acronyms used to describe the sequences in the scientific literature. In 2002, Tang, et al. showed evidence that CRISPR repeat regions from the genome of Archaeoglobus fulgidus were transcribed into long RNA molecules that were subsequently processed into unit-length small RNAs, plus some longer forms of 2, 3, or more spacer-repeat units. A major addition to the understanding of CRISPR came with Jansen’s observation that the prokaryote repeat cluster was accompanied by a set of homologous genes that make up CRISPR-associated systems or cas genes. Four cas genes (cas 1 – 4) were initially recognized. 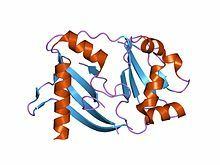 The Cas proteins showed helicase and nuclease motifs, suggesting a role in the dynamic structure of the CRISPR loci. In this publication the acronym CRISPR was coined as the universal name of this pattern. However, the CRISPR function remained enigmatic. Researchers studied a simpler CRISPR system from Streptococcus pyogenes that relies on the protein Cas9. The Cas9 endonuclease is a four-component system that includes two small RNA molecules named CRISPR RNA (crRNA) and trans-activating CRISPR RNA (tracrRNA). Jennifer Doudna and Emmanuelle Charpentier re-engineered the Cas9 endonuclease into a more manageable two-component system by fusing the two RNA molecules into a “single-guide RNA” that, when combined with Cas9, could find and cut the DNA target specified by the guide RNA. By manipulating the nucleotide sequence of the guide RNA, the artificial Cas9 system could be programmed to target any DNA sequence for cleavage. Another group of collaborators comprising Virginijus Šikšnys together with Gasiūnas, Barrangou and Horvath showed that Cas9 from the S. thermophilus CRISPR system can also be reprogrammed to target a site of their choosing by changing the sequence of its crRNA. These advances fueled efforts to edit genomes with the modified CRISPR-Cas9 system. 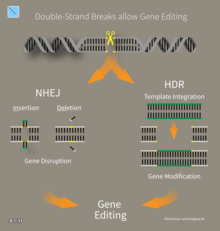 Feng Zhang‘s and George Church‘s groups simultaneously described genome editing in human cell cultures using CRISPR-Cas9 for the first time. It has since been used in a wide range of organisms, including baker’s yeast (Saccharomyces cerevisiae), the opportunistic pathogen Candida albicans, zebrafish (Danio rerio), fruit flies (Drosophila melanogaster), ants (Harpegnathos saltator and Ooceraea biroi), mosquitoes (Aedes aegypti), nematodes (Caenorhabditis elegans), plants, mice, monkeys and human embryos. The CRISPR-Cas9 system has shown to make effective gene edits in Human tripronuclear zygotes first described in a 2015 paper by Chinese scientists P. Liang and Y. Xu. The system made a successful cleavage of mutant Beta-Hemoglobin (HBB) in 28 out of 54 embryos. 4 out of the 28 embryos were successfully recombined using a donor template given by the scientists. The scientists showed that during DNA recombination of the cleaved strand, the homologous endogenous sequence HBD competes with the exogenous donor template. DNA repair in human embryos is much more complicated and particular than in derived stem cells. In 2015, the nuclease Cpf1 was characterized in the CRISPR/Cpf1 system of the bacterium Francisella novicida. 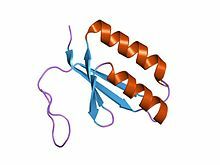 The name, from a TIGRFAMs protein family definition built in 2012, reflects the prevalence of its CRISPR-Cas subtype in the Prevotella and Francisella lineages. Cpf1 showed several key differences from Cas9 including: causing a ‘staggered’ cut in double stranded DNA as opposed to the ‘blunt’ cut produced by Cas9, relying on a ‘T rich’ PAM (providing alternative targeting sites to Cas9) and requiring only a CRISPR RNA (crRNA) for successful targeting. By contrast Cas9 requires both crRNA and a transactivating crRNA (tracrRNA). These differences may give Cpf1 some advantages over Cas9. For example, Cpf1’s small crRNAs are ideal for multiplexed genome editing, as more of them can be packaged in one vector than can Cas9’s sgRNAs. As well, the sticky 5′ overhangs left by Cpf1 can be used for DNA assembly that is much more target-specific than traditional Restriction Enzyme cloning. Finally, Cpf1 cleaves DNA 18-23 base pairs downstream from the PAM site. This means there is no disruption to the recognition sequence after repair, and so Cpf1 enables multiple rounds of DNA cleavage. By contrast, since Cas9 cuts only 3 base pairs upstream of the PAM site, the NHEJ pathway results in indel mutations which destroy the recognition sequence, thereby preventing further rounds of cutting. In theory, repeated rounds of DNA cleavage should cause an increased opportunity for the desired genomic editing to occur. The CRISPR array comprises an AT-rich leader sequence followed by short repeats that are separated by unique spacers. CRISPR repeats typically range in size from 28 to 37 base pairs (bps), though there can be as few as 23 bp and as many as 55 bp. Some show dyad symmetry, implying the formation of a secondary structure such as a stem-loop (‘hairpin’) in the RNA, while others are designed to be unstructured. The size of spacers in different CRISPR arrays is typically 32 to 38 bp (range 21 to 72 bp). New spacers can appear rapidly as part of the immune response to phage infection. There are usually fewer than 50 units of the repeat-spacer sequence in a CRISPR array. CRISPR-Cas systems fall into two classes. Class 1 systems use a complex of multiple Cas proteins to degrade foreign nucleic acids. Class 2 systems use a single large Cas protein for the same purpose. Class 1 is divided into types I, III, and IV; class 2 is divided into types II, V, and VI. The 6 system types are divided into 19 subtypes. Each type and most subtypes are characterized by a “signature gene” found almost exclusively in the category. Classification is also based on the complement of cas genes that are present. Most CRISPR-Cas systems have a Cas1 protein. The phylogeny of Cas1 proteins generally agrees with the classification system. Many organisms contain multiple CRISPR-Cas systems suggesting that they are compatible and may share components. The sporadic distribution of the CRISPR/Cas subtypes suggests that the CRISPR/Cas system is subject to horizontal gene transfer during microbial evolution. Type III systems, like type I require six or seven Cas proteins binding to crRNAs. The type III systems analysed from S. solfataricus and P. furiosus both target the mRNA of phages rather than phage DNA genome, which may make these systems uniquely capable of targeting RNA-based phage genomes. Type III systems were found to target DNA in addition to RNA using a different Cas protein in the complex. The cas genes in the adaptor and effector modules of the CRISPR-Cas system are believed to have evolved from two different ancestral modules. A transposon-like element called casposon encoding the Cas1-like integrase and potentially other components of the adaptation module was inserted next to the ancestral effector module, which likely functioned as an independent innate immune system. The highly conserved cas1 and cas2 genes of the adaptor module evolved from the ancestral module while a variety of class 1 effector was genes evolved from the ancestral effector module. The evolution of these various class 1 effector module cas genes was guided by various mechanisms, such as duplication events. On the other hand, each type of class 2 effector module arose from subsequent independent insertions of mobile genetic elements. These mobile genetic elements took the place of the multiple gene effector modules to create single gene effector modules that produce large proteins which perform all the necessary tasks of the effector module. The spacer regions of CRISPR-Cas systems are taken directly from foreign mobile genetic elements and thus their long term evolution is hard to trace. The non-random evolution of these spacer regions has been found to be highly dependent on the environment and the particular foreign mobile genetic elements it contains. 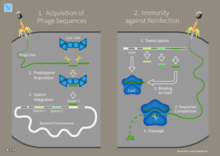 CRISPR/Cas can immunize bacteria against certain phages and thus halt transmission. For this reason, Koonin described CRISPR/Cas as a Lamarckian inheritance mechanism. However, this was disputed by a critic who noted, “We should remember [Lamarck] for the good he contributed to science, not for things that resemble his theory only superficially. Indeed, thinking of CRISPR and other phenomena as Lamarckian only obscures the simple and elegant way evolution really works”. As more recent studies have been conducted, it has become apparent that the acquired spacer regions of CRISPR-Cas systems are a form of Lamarckian evolution because they are genetic mutations that are acquired and then passed on. On the other hand, the evolution of the Cas gene machinery that facilitates the system evolves through classic Darwinian evolution. A study of 124 S. thermophilus strains showed that 26% of all spacers were unique and that different CRISPR loci showed different rates of spacer acquisition. Some CRISPR loci evolve more rapidly than others, which allowed the strains’ phylogenetic relationships to be determined. A comparative genomic analysis showed that E. coli and S. enterica evolve much more slowly than S. thermophilus. The latter’s strains that diverged 250 thousand years ago still contained the same spacer complement. CRISPRs were analysed from the metagenomes produced for the human microbiome project. Although most were body-site specific, some within a body site are widely shared among individuals. One of these loci originated from streptococcal species and contained ≈15,000 spacers, 50% of which were unique. Similar to the targeted studies of the oral cavity, some showed little evolution over time. CRISPRs are widely distributed among bacteria and archaea and show some sequence similarities. Their most notable characteristic is their repeating spacers and direct repeats. This characteristic makes CRISPRs easily identifiable in long sequences of DNA, since the number of repeats decreases the likelihood of a false positive match. Another way for bacteria to defend against phage infection is by having chromosomal islands. A subtype of chromosomal islands called phage-inducible chromosomal island (PICI) is excised from a bacterial chromosome upon phage infection and can inhibit phage replication. PICIs are induced, excised, replicated and finally packaged into small capsids by certain staphylococcal temperate phages. PICIs use several mechanisms to block phage reproduction. In first mechanism PICI-encoded Ppi differentially blocks phage maturation by binding or interacting specifically with phage TerS, hence blocks phage TerS/TerL complex formation responsible for phage DNA packaging. In second mechanism PICI CpmAB redirect the phage capsid morphogenetic protein to make 95% of SaPI-sized capsid and phage DNA can package only 1/3rd of their genome in these small capsid and hence become nonviable phage. The third mechanism involves two proteins, PtiA and PtiB, that target the LtrC, which is responsible for the production of virion and lysis proteins. This interference mechanism is modulated by a modulatory protein, PtiM, binds to one of the interference-mediating proteins, PtiA, and hence achieving the required level of interference. One study showed that lytic ICP1 phage, which specifically targets Vibrio cholerae serogroup O1, has acquired a CRISPR/Cas system that targets a V. cholera PICI-like element. 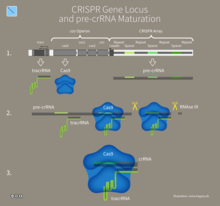 The system has 2 CRISPR loci and 9 Cas genes. It seems to be homologous to the I-F system found in Yersinia pestis. Moreover, like the bacterial CRISPR/Cas system, ICP1 CRISPR/Cas can acquire new sequences, which allows phage and host to co-evolve. ^ a b Barrangou R (2015). “The roles of CRISPR-Cas systems in adaptive immunity and beyond”. Current Opinion in Immunology. 32: 36–41. doi:10.1016/j.coi.2014.12.008. PMID 25574773. ^ Zhang F, Wen Y, Guo X (2014). “CRISPR/Cas9 for genome editing: progress, implications and challenges”. Human Molecular Genetics. 23 (R1): R40–6. doi:10.1093/hmg/ddu125. PMID 24651067. ^ a b c d e Hsu PD, Lander ES, Zhang F (June 2014). “Development and applications of CRISPR-Cas9 for genome engineering”. Cell. 157 (6): 1262–78. doi:10.1016/j.cell.2014.05.010. PMC 4343198. PMID 24906146. ^ Horvath P, Barrangou R (January 2010). “CRISPR/Cas, the immune system of bacteria and archaea”. Science. 327 (5962): 167–70. doi:10.1126/science.1179555. PMID 20056882. ^ Redman M, King A, Watson C, King D (August 2016). “What is CRISPR/Cas9?”. Archives of Disease in Childhood. Education and Practice Edition. 101 (4): 213–5. doi:10.1136/archdischild-2016-310459. PMC 4975809. PMID 27059283. ^ a b Marraffini LA, Sontheimer EJ (December 2008). “CRISPR interference limits horizontal gene transfer in staphylococci by targeting DNA”. Science. 322 (5909): 1843–5. Bibcode:2008Sci…322.1843M. doi:10.1126/science.1165771. PMC 2695655. PMID 19095942. ^ Mohanraju P, Makarova KS, Zetsche B, Zhang F, Koonin EV, van der Oost J (2016). “Diverse evolutionary roots and mechanistic variations of the CRISPR-Cas systems”. Science. 353 (6299): aad5147. doi:10.1126/science.aad5147. PMID 27493190. ^ Hille F, Richter H, Wong SP, Bratovič M, Ressel S, Charpentier E (March 2018). “The Biology of CRISPR-Cas: Backward and Forward”. Cell. 172 (6): 1239–1259. doi:10.1016/j.cell.2017.11.032. PMID 29522745. ^ Ishino Y, Shinagawa H, Makino K, Amemura M, Nakata A (December 1987). “Nucleotide sequence of the iap gene, responsible for alkaline phosphatase isozyme conversion in Escherichia coli, and identification of the gene product”. Journal of Bacteriology. 169 (12): 5429–33. PMC 213968. PMID 3316184. ^ van Soolingen D, de Haas PE, Hermans PW, Groenen PM, van Embden JD (August 1993). “Comparison of various repetitive DNA elements as genetic markers for strain differentiation and epidemiology of Mycobacterium tuberculosis”. Journal of Clinical Microbiology. 31 (8): 1987–95. PMC 265684. PMID 7690367. ^ Groenen PM, Bunschoten AE, van Soolingen D, van Embden JD (December 1993). “Nature of DNA polymorphism in the direct repeat cluster of Mycobacterium tuberculosis; application for strain differentiation by a novel typing method”. Molecular Microbiology. 10 (5): 1057–65. doi:10.1111/j.1365-2958.1993.tb00976.x. PMID 7934856. ^ a b c Mojica FJ, Montoliu L (2016). “On the Origin of CRISPR-Cas Technology: From Prokaryotes to Mammals”. Trends in Microbiology. 24 (10): 811–20. doi:10.1016/j.tim.2016.06.005. PMID 27401123. ^ a b Mojica FJ, Rodriguez-Valera F (2016). “The discovery of CRISPR in archaea and bacteria”. The FEBS Journal. 283 (17): 3162–9. doi:10.1111/febs.13766. PMID 27234458. ^ Mojica FJ, Díez-Villaseñor C, Soria E, Juez G (April 2000). “Biological significance of a family of regularly spaced repeats in the genomes of Archaea, Bacteria and mitochondria”. Molecular Microbiology. 36 (1): 244–6. doi:10.1046/j.1365-2958.2000.01838.x. PMID 10760181. ^ Charpentier E, Richter H, van der Oost J, White MF (May 2015). “Biogenesis pathways of RNA guides in archaeal and bacterial CRISPR-Cas adaptive immunity”. FEMS Microbiology Reviews. 39 (3): 428–41. doi:10.1093/femsre/fuv023. PMC 5965381. PMID 25994611. ^ Jansen R, Embden JD, Gaastra W, Schouls LM (March 2002). “Identification of genes that are associated with DNA repeats in prokaryotes”. Molecular Microbiology. 43 (6): 1565–75. doi:10.1046/j.1365-2958.2002.02839.x. PMID 11952905. ^ a b Horvath P, Barrangou R (January 2010). “CRISPR/Cas, the immune system of bacteria and archaea”. Science. 327 (5962): 167–70. Bibcode:2010Sci…327..167H. doi:10.1126/Science.1179555. PMID 20056882. ^ a b Marraffini LA, Sontheimer EJ (March 2010). “CRISPR interference: RNA-directed adaptive immunity in bacteria and archaea”. Nature Reviews Genetics. 11 (3): 181–90. doi:10.1038/nrg2749. PMC 2928866. PMID 20125085. ^ Grissa I, Vergnaud G, Pourcel C (May 2007). “The CRISPRdb database and tools to display CRISPRs and to generate dictionaries of spacers and repeats”. BMC Bioinformatics. 8: 172. doi:10.1186/1471-2105-8-172. PMC 1892036. PMID 17521438. ^ a b Pourcel C, Salvignol G, Vergnaud G (March 2005). “CRISPR elements in Yersinia pestis acquire new repeats by preferential uptake of bacteriophage DNA, and provide additional tools for evolutionary studies”. Microbiology. 151 (Pt 3): 653–63. doi:10.1099/mic.0.27437-0. PMID 15758212. ^ a b Mojica FJ, Díez-Villaseñor C, García-Martínez J, Soria E (February 2005). “Intervening sequences of regularly spaced prokaryotic repeats derive from foreign genetic elements”. Journal of Molecular Evolution. 60 (2): 174–82. Bibcode:2005JMolE..60..174M. doi:10.1007/s00239-004-0046-3. PMID 15791728. ^ a b Bolotin A, Quinquis B, Sorokin A, Ehrlich SD (August 2005). “Clustered regularly interspaced short palindrome repeats (CRISPRs) have spacers of extrachromosomal origin”. Microbiology. 151 (Pt 8): 2551–61. doi:10.1099/mic.0.28048-0. PMID 16079334. ^ Morange M (June 2015). “What history tells us XXXVII. CRISPR-Cas: The discovery of an immune system in prokaryotes”. Journal of Biosciences. 40 (2): 221–3. doi:10.1007/s12038-015-9532-6. PMID 25963251. ^ Lander ES (January 2016). “The Heroes of CRISPR”. Cell. 164 (1–2): 18–28. doi:10.1016/j.cell.2015.12.041. PMID 26771483. ^ Makarova KS, Grishin NV, Shabalina SA, Wolf YI, Koonin EV (March 2006). “A putative RNA-interference-based immune system in prokaryotes: computational analysis of the predicted enzymatic machinery, functional analogies with eukaryotic RNAi, and hypothetical mechanisms of action”. Biology Direct. 1: 7. doi:10.1186/1745-6150-1-7. PMC 1462988. PMID 16545108. ^ a b c Marraffini LA (October 2015). “CRISPR-Cas immunity in prokaryotes”. Nature. 526 (7571): 55–61. Bibcode:2015Natur.526…55M. doi:10.1038/nature15386. PMID 26432244. ^ Pennisi E (August 2013). “The CRISPR craze”. News Focus. Science. 341 (6148): 833–6. doi:10.1126/science.341.6148.833. PMID 23970676. ^ Brouns SJ, Jore MM, Lundgren M, Westra ER, Slijkhuis RJ, Snijders AP, Dickman MJ, Makarova KS, Koonin EV, van der Oost J (August 2008). “Small CRISPR RNAs guide antiviral defense in prokaryotes”. Science. 321 (5891): 960–4. Bibcode:2008Sci…321..960B. doi:10.1126/science.1159689. PMC 5898235. PMID 18703739. ^ a b Garneau JE, Dupuis MÈ, Villion M, Romero DA, Barrangou R, Boyaval P, et al. (November 2010). “The CRISPR/Cas bacterial immune system cleaves bacteriophage and plasmid DNA”. Nature. 468 (7320): 67–71. Bibcode:2010Natur.468…67G. CiteSeerX 10.1.1.451.9645. doi:10.1038/nature09523. PMID 21048762. ^ Barrangou R (November 2015). “Diversity of CRISPR-Cas immune systems and molecular machines”. Genome Biology. 16: 247. doi:10.1186/s13059-015-0816-9. PMC 4638107. PMID 26549499. ^ Jinek M, Chylinski K, Fonfara I, Hauer M, Doudna JA, Charpentier E (August 2012). “A programmable dual-RNA-guided DNA endonuclease in adaptive bacterial immunity”. Science. 337 (6096): 816–21. Bibcode:2012Sci…337..816J. doi:10.1126/science.1225829. PMID 22745249. ^ Cong L, Ran FA, Cox D, Lin S, Barretto R, Habib N, Hsu PD, Wu X, Jiang W, Marraffini LA, Zhang F (February 2013). “Multiplex genome engineering using CRISPR/Cas systems”. Science. 339 (6121): 819–23. Bibcode:2013Sci…339..819C. doi:10.1126/science.1231143. PMC 3795411. PMID 23287718. ^ Mali P, Yang L, Esvelt KM, Aach J, Guell M, DiCarlo JE, Norville JE, Church GM (February 2013). “RNA-guided human genome engineering via Cas9”. Science. 339 (6121): 823–6. Bibcode:2013Sci…339..823M. doi:10.1126/science.1232033. PMC 3712628. PMID 23287722. ^ DiCarlo JE, Norville JE, Mali P, Rios X, Aach J, Church GM (April 2013). “Genome engineering in Saccharomyces cerevisiae using CRISPR-Cas systems”. Nucleic Acids Research. 41 (7): 4336–43. doi:10.1093/nar/gkt135. PMC 3627607. PMID 23460208. ^ Zhang GC, Kong II, Kim H, Liu JJ, Cate JH, Jin YS (December 2014). “Construction of a quadruple auxotrophic mutant of an industrial polyploid saccharomyces cerevisiae strain by using RNA-guided Cas9 nuclease”. Applied and Environmental Microbiology. 80 (24): 7694–701. doi:10.1128/AEM.02310-14. PMC 4249234. PMID 25281382. ^ Liu JJ, Kong II, Zhang GC, Jayakody LN, Kim H, Xia PF, Kwak S, Sung BH, Sohn JH, Walukiewicz HE, Rao CV, Jin YS (April 2016). “Metabolic Engineering of Probiotic Saccharomyces boulardii“. Applied and Environmental Microbiology. 82 (8): 2280–2287. doi:10.1128/AEM.00057-16. PMC 4959471. PMID 26850302. ^ Vyas VK, Barrasa MI, Fink GR (2015). “Candida albicans CRISPR system permits genetic engineering of essential genes and gene families”. Science Advances. 1 (3): e1500248. Bibcode:2015SciA….1E0248V. doi:10.1126/sciadv.1500248. PMC 4428347. PMID 25977940. ^ Ng H, Dean N (2017). “Candida albicans by Increased Single Guide RNA Expression”. mSphere. 2 (2): e00385–16. doi:10.1128/mSphere.00385-16. PMC 5397569. PMID 28435892. ^ Hwang WY, Fu Y, Reyon D, Maeder ML, Tsai SQ, Sander JD, Peterson RT, Yeh JR, Joung JK (March 2013). “Efficient genome editing in zebrafish using a CRISPR-Cas system”. Nature Biotechnology. 31 (3): 227–9. doi:10.1038/nbt.2501. PMC 3686313. PMID 23360964. ^ Gratz SJ, Cummings AM, Nguyen JN, Hamm DC, Donohue LK, Harrison MM, Wildonger J, O’Connor-Giles KM (August 2013). “Genome engineering of Drosophila with the CRISPR RNA-guided Cas9 nuclease”. Genetics. 194 (4): 1029–35. doi:10.1534/genetics.113.152710. PMC 3730909. PMID 23709638. ^ Bassett AR, Tibbit C, Ponting CP, Liu JL (July 2013). “Highly efficient targeted mutagenesis of Drosophila with the CRISPR/Cas9 system”. Cell Reports. 4 (1): 220–8. doi:10.1016/j.celrep.2013.06.020. PMC 3714591. PMID 23827738. ^ Yan H, Opachaloemphan C, Mancini G, Yang H, Gallitto M, Mlejnek J, Leibholz A, Haight K, Ghaninia M, Huo L, Perry M, Slone J, Zhou X, Traficante M, Penick CA, Dolezal K, Gokhale K, Stevens K, Fetter-Pruneda I, Bonasio R, Zwiebel LJ, Berger SL, Liebig J, Reinberg D, Desplan C (August 2017). “An Engineered orco Mutation Produces Aberrant Social Behavior and Defective Neural Development in Ants”. Cell. 170 (4): 736–747.e9. doi:10.1016/j.cell.2017.06.051. PMC 5587193. PMID 28802043. ^ Trible W, Olivos-Cisneros L, McKenzie SK, Saragosti J, Chang NC, Matthews BJ, Oxley PR, Kronauer DJ (August 2017). “orco Mutagenesis Causes Loss of Antennal Lobe Glomeruli and Impaired Social Behavior in Ants”. Cell. 170 (4): 727–735.e10. doi:10.1016/j.cell.2017.07.001. PMC 5556950. PMID 28802042. ^ Kistler KE, Vosshall LB, Matthews BJ (April 2015). “Genome engineering with CRISPR-Cas9 in the mosquito Aedes aegypti”. Cell Reports. 11 (1): 51–60. doi:10.1016/j.celrep.2015.03.009. PMC 4394034. PMID 25818303. ^ Friedland AE, Tzur YB, Esvelt KM, Colaiácovo MP, Church GM, Calarco JA (August 2013). “Heritable genome editing in C. elegans via a CRISPR-Cas9 system”. Nature Methods. 10 (8): 741–3. doi:10.1038/nmeth.2532. PMC 3822328. PMID 23817069. ^ Jiang W, Zhou H, Bi H, Fromm M, Yang B, Weeks DP (November 2013). “Demonstration of CRISPR/Cas9/sgRNA-mediated targeted gene modification in Arabidopsis, tobacco, sorghum and rice”. Nucleic Acids Research. 41 (20): e188. doi:10.1093/nar/gkt780. PMC 3814374. PMID 23999092. ^ Wang H, Yang H, Shivalila CS, Dawlaty MM, Cheng AW, Zhang F, Jaenisch R (May 2013). “One-step generation of mice carrying mutations in multiple genes by CRISPR/Cas-mediated genome engineering”. Cell. 153 (4): 910–8. doi:10.1016/j.cell.2013.04.025. PMC 3969854. PMID 23643243. ^ Guo X, Li XJ (July 2015). “Targeted genome editing in primate embryos”. Cell Research. 25 (7): 767–8. doi:10.1038/cr.2015.64. PMC 4493275. PMID 26032266. ^ Baltimore D, Berg P, Botchan M, Carroll D, Charo RA, Church G, Corn JE, Daley GQ, Doudna JA, Fenner M, Greely HT, Jinek M, Martin GS, Penhoet E, Puck J, Sternberg SH, Weissman JS, Yamamoto KR (April 2015). “Biotechnology. A prudent path forward for genomic engineering and germline gene modification”. Science. 348 (6230): 36–8. Bibcode:2015Sci…348…36B. doi:10.1126/science.aab1028. PMC 4394183. PMID 25791083. ^ Larson MH, Gilbert LA, Wang X, Lim WA, Weissman JS, Qi LS (November 2013). “CRISPR interference (CRISPRi) for sequence-specific control of gene expression”. Nature Protocols. 8 (11): 2180–96. doi:10.1038/nprot.2013.132. PMC 3922765. PMID 24136345. ^ Liang P, Xu Y, Zhang X, Ding C, Huang R, Zhang Z, et al. (May 2015). “CRISPR/Cas9-mediated gene editing in human tripronuclear zygotes”. Protein & Cell. 6 (5): 363–372. doi:10.1007/s13238-015-0153-5. PMC 4417674. PMID 25894090. ^ Zetsche B, Gootenberg JS, Abudayyeh OO, Slaymaker IM, Makarova KS, Essletzbichler P, et al. (October 2015). “Cpf1 is a single RNA-guided endonuclease of a class 2 CRISPR-Cas system”. Cell. 163 (3): 759–71. doi:10.1016/j.cell.2015.09.038. PMC 4638220. PMID 26422227. ^ Fonfara I, Richter H, Bratovič M, Le Rhun A, Charpentier E (April 2016). “The CRISPR-associated DNA-cleaving enzyme Cpf1 also processes precursor CRISPR RNA”. Nature. 532 (7600): 517–21. Bibcode:2016Natur.532..517F. doi:10.1038/nature17945. PMID 27096362. ^ Kim H, Kim ST, Ryu J, Kang BC, Kim JS, and Kim SG (February 2017). “CRISPR/Cpf1-mediated DNA-free plant genome editing”. Nature Communications. 8 (14406): 14406. Bibcode:2017NatCo…814406K. doi:10.1038/ncomms14406. PMC 5316869. PMID 28205546. ^ “Cpf1 Nuclease”. abmgood.com. Retrieved 2017-12-14. ^ Hille F, Charpentier E (November 2016). “CRISPR-Cas: biology, mechanisms and relevance”. Philosophical Transactions of the Royal Society of London. Series B, Biological Sciences. 371 (1707): 20150496. doi:10.1098/rstb.2015.0496. PMC 5052741. PMID 27672148. ^ a b c Barrangou R, Marraffini LA (April 2014). “CRISPR-Cas systems: Prokaryotes upgrade to adaptive immunity”. Molecular Cell. 54 (2): 234–44. doi:10.1016/j.molcel.2014.03.011. PMC 4025954. PMID 24766887. ^ a b c Tyson GW, Banfield JF (January 2008). “Rapidly evolving CRISPRs implicated in acquired resistance of microorganisms to viruses”. Environmental Microbiology. 10 (1): 200–7. doi:10.1111/j.1462-2920.2007.01444.x. PMID 17894817. ^ a b c d e f g h i Makarova KS, Wolf YI, Alkhnbashi OS, Costa F, Shah SA, Saunders SJ, et al. (November 2015). “An updated evolutionary classification of CRISPR-Cas systems”. Nature Reviews. Microbiology. 13 (11): 722–36. doi:10.1038/nrmicro3569. PMC 5426118. PMID 26411297. ^ a b c Wright AV, Nuñez JK, Doudna JA (January 2016). “Biology and Applications of CRISPR Systems: Harnessing Nature’s Toolbox for Genome Engineering”. Cell. 164 (1–2): 29–44. doi:10.1016/j.cell.2015.12.035. PMID 26771484. ^ Westra ER, Dowling AJ, Broniewski JM, van Houte S (November 2016). “Evolution and Ecology of CRISPR”. Annual Review of Ecology, Evolution, and Systematics. 47 (1): 307–331. doi:10.1146/annurev-ecolsys-121415-032428. ^ a b c Wiedenheft B, Sternberg SH, Doudna JA (February 2012). “RNA-guided genetic silencing systems in bacteria and archaea”. Nature. 482 (7385): 331–8. Bibcode:2012Natur.482..331W. doi:10.1038/nature10886. PMID 22337052. ^ a b Deng L, Garrett RA, Shah SA, Peng X, She Q (March 2013). “A novel interference mechanism by a type IIIB CRISPR-Cmr module in Sulfolobus”. Molecular Microbiology. 87 (5): 1088–99. doi:10.1111/mmi.12152. PMID 23320564. ^ Sinkunas T, Gasiunas G, Fremaux C, Barrangou R, Horvath P, Siksnys V (April 2011). “Cas3 is a single-stranded DNA nuclease and ATP-dependent helicase in the CRISPR/Cas immune system”. The EMBO Journal. 30 (7): 1335–42. doi:10.1038/emboj.2011.41. PMC 3094125. PMID 21343909. ^ Huo Y, Nam KH, Ding F, Lee H, Wu L, Xiao Y, Farchione MD, Zhou S, Rajashankar K, Kurinov I, Zhang R, Ke A (September 2014). “Structures of CRISPR Cas3 offer mechanistic insights into Cascade-activated DNA unwinding and degradation”. Nature Structural & Molecular Biology. 21 (9): 771–7. doi:10.1038/nsmb.2875. PMC 4156918. PMID 25132177. ^ a b Chylinski K, Makarova KS, Charpentier E, Koonin EV (June 2014). “Classification and evolution of type II CRISPR-Cas systems”. Nucleic Acids Research. 42 (10): 6091–105. doi:10.1093/nar/gku241. PMC 4041416. PMID 24728998. ^ a b Makarova KS, Aravind L, Wolf YI, Koonin EV (July 2011). “Unification of Cas protein families and a simple scenario for the origin and evolution of CRISPR-Cas systems”. Biology Direct. 6: 38. doi:10.1186/1745-6150-6-38. PMC 3150331. PMID 21756346. ^ a b c Gasiunas G, Barrangou R, Horvath P, Siksnys V (September 2012). “Cas9-crRNA ribonucleoprotein complex mediates specific DNA cleavage for adaptive immunity in bacteria”. Proceedings of the National Academy of Sciences of the United States of America. 109 (39): E2579–86. Bibcode:2012PNAS..109E2579G. doi:10.1073/pnas.1208507109. PMC 3465414. PMID 22949671. ^ Heler R, Samai P, Modell JW, Weiner C, Goldberg GW, Bikard D, Marraffini LA (March 2015). 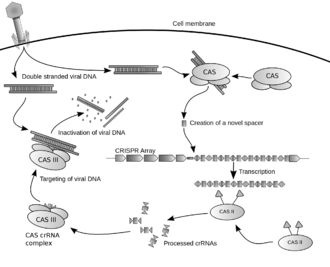 “Cas9 specifies functional viral targets during CRISPR-Cas adaptation”. Nature. 519 (7542): 199–202. Bibcode:2015Natur.519..199H. doi:10.1038/nature14245. PMC 4385744. PMID 25707807. ^ Nam KH, Kurinov I, Ke A (September 2011). “Crystal structure of clustered regularly interspaced short palindromic repeats (CRISPR)-associated Csn2 protein revealed Ca2+-dependent double-stranded DNA binding activity”. The Journal of Biological Chemistry. 286 (35): 30759–68. doi:10.1074/jbc.M111.256263. PMC 3162437. PMID 21697083. ^ Chylinski K, Le Rhun A, Charpentier E (May 2013). “The tracrRNA and Cas9 families of type II CRISPR-Cas immunity systems”. RNA Biology. 10 (5): 726–37. doi:10.4161/rna.24321. PMC 3737331. PMID 23563642. ^ Cox DB, Gootenberg JS, Abudayyeh OO, Franklin B, Kellner MJ, Joung J, Zhang F (November 2017). “RNA editing with CRISPR-Cas13”. Science. 358 (6366): 1019–1027. Bibcode:2017Sci…358.1019C. doi:10.1126/science.aaq0180. PMC 5793859. PMID 29070703. ^ a b Aliyari R, Ding SW (January 2009). “RNA-based viral immunity initiated by the Dicer family of host immune receptors”. Immunological Reviews. 227 (1): 176–88. doi:10.1111/j.1600-065X.2008.00722.x. PMC 2676720. PMID 19120484. ^ a b Dugar G, Herbig A, Förstner KU, Heidrich N, Reinhardt R, Nieselt K, Sharma CM (May 2013). “High-resolution transcriptome maps reveal strain-specific regulatory features of multiple Campylobacter jejuni isolates”. PLoS Genetics. 9 (5): e1003495. doi:10.1371/journal.pgen.1003495. PMC 3656092. PMID 23696746. ^ Hatoum-Aslan A, Maniv I, Marraffini LA (December 2011). “Mature clustered, regularly interspaced, short palindromic repeats RNA (crRNA) length is measured by a ruler mechanism anchored at the precursor processing site”. Proceedings of the National Academy of Sciences of the United States of America. 108 (52): 21218–22. Bibcode:2011PNAS..10821218H. doi:10.1073/pnas.1112832108. PMC 3248500. PMID 22160698. ^ a b Yosef I, Goren MG, Qimron U (July 2012). “Proteins and DNA elements essential for the CRISPR adaptation process in Escherichia coli“. Nucleic Acids Research. 40 (12): 5569–76. doi:10.1093/nar/gks216. PMC 3384332. PMID 22402487. ^ a b c d Swarts DC, Mosterd C, van Passel MW, Brouns SJ (2012). “CRISPR interference directs strand specific spacer acquisition”. PLOS One. 7 (4): e35888. Bibcode:2012PLoSO…735888S. doi:10.1371/journal.pone.0035888. PMC 3338789. PMID 22558257. ^ Babu M, Beloglazova N, Flick R, Graham C, Skarina T, Nocek B, et al. (January 2011). “A dual function of the CRISPR-Cas system in bacterial antivirus immunity and DNA repair”. Molecular Microbiology. 79 (2): 484–502. doi:10.1111/j.1365-2958.2010.07465.x. PMC 3071548. PMID 21219465. ^ Han D, Lehmann K, Krauss G (June 2009). “SSO1450–a CAS1 protein from Sulfolobus solfataricus P2 with high affinity for RNA and DNA”. FEBS Letters. 583 (12): 1928–32. doi:10.1016/j.febslet.2009.04.047. PMID 19427858. ^ Wiedenheft B, Zhou K, Jinek M, Coyle SM, Ma W, Doudna JA (June 2009). “Structural basis for DNase activity of a conserved protein implicated in CRISPR-mediated genome defense”. Structure. 17 (6): 904–12. doi:10.1016/j.str.2009.03.019. PMID 19523907. ^ Beloglazova N, Brown G, Zimmerman MD, Proudfoot M, Makarova KS, Kudritska M, et al. (July 2008). “A novel family of sequence-specific endoribonucleases associated with the clustered regularly interspaced short palindromic repeats”. The Journal of Biological Chemistry. 283 (29): 20361–71. doi:10.1074/jbc.M803225200. PMC 2459268. PMID 18482976. ^ Samai P, Smith P, Shuman S (December 2010). “Structure of a CRISPR-associated protein Cas2 from Desulfovibrio vulgaris”. Acta Crystallographica Section F. 66 (Pt 12): 1552–6. doi:10.1107/S1744309110039801. PMC 2998353. PMID 21139194. ^ Nam KH, Ding F, Haitjema C, Huang Q, DeLisa MP, Ke A (October 2012). “Double-stranded endonuclease activity in Bacillus halodurans clustered regularly interspaced short palindromic repeats (CRISPR)-associated Cas2 protein”. The Journal of Biological Chemistry. 287 (43): 35943–52. doi:10.1074/jbc.M112.382598. PMC 3476262. PMID 22942283. ^ a b Nuñez JK, Kranzusch PJ, Noeske J, Wright AV, Davies CW, Doudna JA (June 2014). “Cas1-Cas2 complex formation mediates spacer acquisition during CRISPR-Cas adaptive immunity”. Nature Structural & Molecular Biology. 21 (6): 528–34. doi:10.1038/nsmb.2820. PMC 4075942. PMID 24793649. ^ Nuñez JK, Lee AS, Engelman A, Doudna JA (March 2015). “Integrase-mediated spacer acquisition during CRISPR-Cas adaptive immunity”. Nature. 519 (7542): 193–8. Bibcode:2015Natur.519..193N. doi:10.1038/nature14237. PMC 4359072. PMID 25707795. ^ Wang J, Li J, Zhao H, Sheng G, Wang M, Yin M, Wang Y (November 2015). “Structural and Mechanistic Basis of PAM-Dependent Spacer Acquisition in CRISPR-Cas Systems”. Cell. 163 (4): 840–53. doi:10.1016/j.cell.2015.10.008. PMID 26478180. ^ Nuñez JK, Harrington LB, Kranzusch PJ, Engelman AN, Doudna JA (November 2015). “Foreign DNA capture during CRISPR-Cas adaptive immunity”. Nature. 527 (7579): 535–8. Bibcode:2015Natur.527..535N. doi:10.1038/nature15760. PMC 4662619. PMID 26503043. ^ Sorek R, Lawrence CM, Wiedenheft B (2013). “CRISPR-mediated adaptive immune systems in bacteria and archaea”. Annual Review of Biochemistry. 82 (1): 237–66. doi:10.1146/annurev-biochem-072911-172315. PMID 23495939. ^ Nuñez JK, Bai L, Harrington LB, Hinder TL, Doudna JA (June 2016). “CRISPR Immunological Memory Requires a Host Factor for Specificity”. Molecular Cell. 62 (6): 824–833. doi:10.1016/j.molcel.2016.04.027. PMID 27211867. ^ Fagerlund RD, Wilkinson ME, Klykov O, Barendregt A, Pearce FG, Kieper SN, Maxwell HW, Capolupo A, Heck AJ, Krause KL, Bostina M, Scheltema RA, Staals RH, Fineran PC (June 2017). “Spacer capture and integration by a type I-F Cas1-Cas2-3 CRISPR adaptation complex”. Proceedings of the National Academy of Sciences of the United States of America. 114 (26): E5122–E5128. doi:10.1073/pnas.1618421114. PMC 5495228. PMID 28611213. ^ Rollie C, Graham S, Rouillon C, White MF (February 2018). “Prespacer processing and specific integration in a Type I-A CRISPR system”. Nucleic Acids Research. 46 (3): 1007–1020. doi:10.1093/nar/gkx1232. PMC 5815122. PMID 29228332. ^ a b c d Horvath P, Romero DA, Coûté-Monvoisin AC, Richards M, Deveau H, Moineau S, et al. (February 2008). “Diversity, activity, and evolution of CRISPR loci in Streptococcus thermophilus“. Journal of Bacteriology. 190 (4): 1401–12. doi:10.1128/JB.01415-07. PMC 2238196. PMID 18065539. ^ a b c Deveau H, Barrangou R, Garneau JE, Labonté J, Fremaux C, Boyaval P, Romero DA, Horvath P, Moineau S (February 2008). “Phage response to CRISPR-encoded resistance in Streptococcus thermophilus“. Journal of Bacteriology. 190 (4): 1390–400. doi:10.1128/JB.01412-07. PMC 2238228. PMID 18065545. ^ Mojica FJ, Díez-Villaseñor C, García-Martínez J, Almendros C (March 2009). “Short motif sequences determine the targets of the prokaryotic CRISPR defence system”. Microbiology. 155 (Pt 3): 733–40. doi:10.1099/mic.0.023960-0. PMID 19246744. ^ a b Lillestøl RK, Shah SA, Brügger K, Redder P, Phan H, Christiansen J, Garrett RA (April 2009). “CRISPR families of the crenarchaeal genus Sulfolobus: bidirectional transcription and dynamic properties”. Molecular Microbiology. 72 (1): 259–72. doi:10.1111/j.1365-2958.2009.06641.x. PMID 19239620. ^ a b Shah SA, Hansen NR, Garrett RA (February 2009). “Distribution of CRISPR spacer matches in viruses and plasmids of crenarchaeal acidothermophiles and implications for their inhibitory mechanism”. Biochemical Society Transactions. 37 (Pt 1): 23–8. doi:10.1042/BST0370023. PMID 19143596. ^ a b Díez-Villaseñor C, Guzmán NM, Almendros C, García-Martínez J, Mojica FJ (May 2013). “CRISPR-spacer integration reporter plasmids reveal distinct genuine acquisition specificities among CRISPR-Cas I-E variants of Escherichia coli“. RNA Biology. 10 (5): 792–802. doi:10.4161/rna.24023. PMC 3737337. PMID 23445770. ^ a b c Erdmann S, Garrett RA (September 2012). “Selective and hyperactive uptake of foreign DNA by adaptive immune systems of an archaeon via two distinct mechanisms”. Molecular Microbiology. 85 (6): 1044–56. doi:10.1111/j.1365-2958.2012.08171.x. PMC 3468723. PMID 22834906. ^ a b Shah SA, Erdmann S, Mojica FJ, Garrett RA (May 2013). “Protospacer recognition motifs: mixed identities and functional diversity”. RNA Biology. 10 (5): 891–9. doi:10.4161/rna.23764. PMC 3737346. PMID 23403393. ^ Andersson AF, Banfield JF (May 2008). “Virus population dynamics and acquired virus resistance in natural microbial communities”. Science. 320 (5879): 1047–50. Bibcode:2008Sci…320.1047A. doi:10.1126/science.1157358. PMID 18497291. ^ a b c d Pride DT, Sun CL, Salzman J, Rao N, Loomer P, Armitage GC, et al. (January 2011). “Analysis of streptococcal CRISPRs from human saliva reveals substantial sequence diversity within and between subjects over time”. Genome Research. 21 (1): 126–36. doi:10.1101/gr.111732.110. PMC 3012920. PMID 21149389. ^ a b Goren MG, Yosef I, Auster O, Qimron U (October 2012). “Experimental definition of a clustered regularly interspaced short palindromic duplicon in Escherichia coli“. Journal of Molecular Biology. 423 (1): 14–6. doi:10.1016/j.jmb.2012.06.037. PMID 22771574. ^ a b c Datsenko KA, Pougach K, Tikhonov A, Wanner BL, Severinov K, Semenova E (July 2012). “Molecular memory of prior infections activates the CRISPR/Cas adaptive bacterial immunity system”. Nature Communications. 3: 945. Bibcode:2012NatCo…3E.945D. doi:10.1038/ncomms1937. PMID 22781758. ^ Gesner EM, Schellenberg MJ, Garside EL, George MM, Macmillan AM (June 2011). “Recognition and maturation of effector RNAs in a CRISPR interference pathway”. Nature Structural & Molecular Biology. 18 (6): 688–92. doi:10.1038/nsmb.2042. PMID 21572444. ^ Sashital DG, Jinek M, Doudna JA (June 2011). “An RNA-induced conformational change required for CRISPR RNA cleavage by the endoribonuclease Cse3”. Nature Structural & Molecular Biology. 18 (6): 680–7. doi:10.1038/nsmb.2043. PMID 21572442. ^ Haurwitz RE, Jinek M, Wiedenheft B, Zhou K, Doudna JA (September 2010). “Sequence- and structure-specific RNA processing by a CRISPR endonuclease”. Science. 329 (5997): 1355–8. Bibcode:2010Sci…329.1355H. doi:10.1126/science.1192272. PMC 3133607. PMID 20829488. ^ a b Kunin V, Sorek R, Hugenholtz P (2007). “Evolutionary conservation of sequence and secondary structures in CRISPR repeats”. Genome Biology. 8 (4): R61. doi:10.1186/gb-2007-8-4-r61. PMC 1896005. PMID 17442114. ^ Carte J, Wang R, Li H, Terns RM, Terns MP (December 2008). “Cas6 is an endoribonuclease that generates guide RNAs for invader defense in prokaryotes”. Genes & Development. 22 (24): 3489–96. doi:10.1101/gad.1742908. PMC 2607076. PMID 19141480. ^ Wang R, Preamplume G, Terns MP, Terns RM, Li H (February 2011). “Interaction of the Cas6 riboendonuclease with CRISPR RNAs: recognition and cleavage”. Structure. 19 (2): 257–64. doi:10.1016/j.str.2010.11.014. PMC 3154685. PMID 21300293. ^ Niewoehner O, Jinek M, Doudna JA (January 2014). “Evolution of CRISPR RNA recognition and processing by Cas6 endonucleases”. Nucleic Acids Research. 42 (2): 1341–53. doi:10.1093/nar/gkt922. PMC 3902920. PMID 24150936. ^ Semenova E, Jore MM, Datsenko KA, Semenova A, Westra ER, Wanner B, et al. (June 2011). “Interference by clustered regularly interspaced short palindromic repeat (CRISPR) RNA is governed by a seed sequence”. Proceedings of the National Academy of Sciences of the United States of America. 108 (25): 10098–103. Bibcode:2011PNAS..10810098S. doi:10.1073/pnas.1104144108. PMC 3121866. PMID 21646539. ^ Gudbergsdottir S, Deng L, Chen Z, Jensen JV, Jensen LR, She Q, Garrett RA (January 2011). “Dynamic properties of the Sulfolobus CRISPR/Cas and CRISPR/Cmr systems when challenged with vector-borne viral and plasmid genes and protospacers”. Molecular Microbiology. 79 (1): 35–49. doi:10.1111/j.1365-2958.2010.07452.x. PMC 3025118. PMID 21166892. ^ Manica A, Zebec Z, Teichmann D, Schleper C (April 2011). “In vivo activity of CRISPR-mediated virus defence in a hyperthermophilic archaeon”. Molecular Microbiology. 80 (2): 481–91. doi:10.1111/j.1365-2958.2011.07586.x. PMID 21385233. ^ Jore MM, Lundgren M, van Duijn E, Bultema JB, Westra ER, Waghmare SP, et al. (May 2011). “Structural basis for CRISPR RNA-guided DNA recognition by Cascade”. Nature Structural & Molecular Biology. 18 (5): 529–36. doi:10.1038/nsmb.2019. PMID 21460843. ^ Wiedenheft B, Lander GC, Zhou K, Jore MM, Brouns SJ, van der Oost J, Doudna JA, Nogales E (September 2011). “Structures of the RNA-guided surveillance complex from a bacterial immune system”. Nature. 477 (7365): 486–9. Bibcode:2011Natur.477..486W. doi:10.1038/nature10402. PMC 4165517. PMID 21938068. ^ Zhang J, Rouillon C, Kerou M, Reeks J, Brugger K, Graham S, Reimann J, Cannone G, Liu H, Albers SV, Naismith JH, Spagnolo L, White MF (February 2012). “Structure and mechanism of the CMR complex for CRISPR-mediated antiviral immunity”. Molecular Cell. 45 (3): 303–13. doi:10.1016/j.molcel.2011.12.013. PMC 3381847. PMID 22227115. ^ a b Hale CR, Zhao P, Olson S, Duff MO, Graveley BR, Wells L, Terns RM, Terns MP (November 2009). “RNA-guided RNA cleavage by a CRISPR RNA-Cas protein complex”. Cell. 139 (5): 945–56. doi:10.1016/j.cell.2009.07.040. PMC 2951265. PMID 19945378. ^ Estrella MA, Kuo FT, Bailey S (2016). “RNA-activated DNA cleavage by the Type III-B CRISPR–Cas effector complex”. Genes and Development. 30 (4): 460–470. doi:10.1101/gad.273722.115. PMID 26848046. ^ a b c Marraffini LA, Sontheimer EJ (January 2010). “Self versus non-self discrimination during CRISPR RNA-directed immunity”. Nature. 463 (7280): 568–71. Bibcode:2010Natur.463..568M. doi:10.1038/nature08703. PMC 2813891. PMID 20072129. ^ Krupovic M, Béguin P, Koonin EV (August 2017). “Casposons: mobile genetic elements that gave rise to the CRISPR-Cas adaptation machinery”. Current Opinion in Microbiology. 38: 36–43. doi:10.1016/j.mib.2017.04.004. PMC 5665730. PMID 28472712. ^ Koonin EV, Makarova KS (May 2013). “CRISPR-Cas: evolution of an RNA-based adaptive immunity system in prokaryotes”. RNA Biology. 10 (5): 679–86. doi:10.4161/rna.24022. PMC 3737325. PMID 23439366. ^ Koonin EV, Makarova KS, Zhang F (June 2017). “Diversity, classification and evolution of CRISPR-Cas systems”. Current Opinion in Microbiology. 37: 67–78. doi:10.1016/j.mib.2017.05.008. PMC 5776717. PMID 28605718. ^ a b Shmakov S, Smargon A, Scott D, Cox D, Pyzocha N, Yan W, Abudayyeh OO, Gootenberg JS, Makarova KS, Wolf YI, Severinov K, Zhang F, Koonin EV (March 2017). “Diversity and evolution of class 2 CRISPR-Cas systems”. Nature Reviews. Microbiology. 15 (3): 169–182. doi:10.1038/nrmicro.2016.184. PMC 5851899. PMID 28111461. ^ Kupczok A, Bollback JP (February 2013). “Probabilistic models for CRISPR spacer content evolution”. BMC Evolutionary Biology. 13 (1): 54. doi:10.1186/1471-2148-13-54. PMC 3704272. PMID 23442002. ^ Sternberg SH, Richter H, Charpentier E, Qimron U (March 2016). “Adaptation in CRISPR-Cas Systems”. Molecular Cell. 61 (6): 797–808. doi:10.1016/j.molcel.2016.01.030. PMID 26949040. ^ Koonin EV, Wolf YI (November 2009). “Is evolution Darwinian or/and Lamarckian?”. Biology Direct. 4: 42. doi:10.1186/1745-6150-4-42. PMC 2781790. PMID 19906303. ^ Weiss A (October 2015). “Lamarckian Illusions”. Trends in Ecology & Evolution. 30 (10): 566–568. doi:10.1016/j.tree.2015.08.003. PMID 26411613. ^ a b Koonin EV, Wolf YI (February 2016). “Just how Lamarckian is CRISPR-Cas immunity: the continuum of evolvability mechanisms”. Biology Direct. 11 (1): 9. doi:10.1186/s13062-016-0111-z. PMC 4765028. PMID 26912144. ^ Heidelberg JF, Nelson WC, Schoenfeld T, Bhaya D (2009). Ahmed N, ed. “Germ warfare in a microbial mat community: CRISPRs provide insights into the co-evolution of host and viral genomes”. PLOS One. 4 (1): e4169. Bibcode:2009PLoSO…4.4169H. doi:10.1371/journal.pone.0004169. PMC 2612747. PMID 19132092. ^ Sampson TR, Saroj SD, Llewellyn AC, Tzeng YL, Weiss DS (May 2013). “A CRISPR/Cas system mediates bacterial innate immune evasion and virulence”. Nature. 497 (7448): 254–7. Bibcode:2013Natur.497..254S. doi:10.1038/nature12048. PMC 3651764. PMID 23584588. ^ Touchon M, Rocha EP (June 2010). Randau L, ed. “The small, slow and specialized CRISPR and anti-CRISPR of Escherichia and Salmonella”. PLOS One. 5 (6): e11126. Bibcode:2010PLoSO…511126T. doi:10.1371/journal.pone.0011126. PMC 2886076. PMID 20559554. ^ a b c Rho M, Wu YW, Tang H, Doak TG, Ye Y (2012). “Diverse CRISPRs evolving in human microbiomes”. PLoS Genetics. 8 (6): e1002441. doi:10.1371/journal.pgen.1002441. PMC 3374615. PMID 22719260. ^ a b Sun CL, Barrangou R, Thomas BC, Horvath P, Fremaux C, Banfield JF (February 2013). “Phage mutations in response to CRISPR diversification in a bacterial population”. Environmental Microbiology. 15 (2): 463–70. doi:10.1111/j.1462-2920.2012.02879.x. PMID 23057534. ^ Kuno S, Sako Y, Yoshida T (May 2014). “Diversification of CRISPR within coexisting genotypes in a natural population of the bloom-forming cyanobacterium Microcystis aeruginosa”. Microbiology. 160 (Pt 5): 903–16. doi:10.1099/mic.0.073494-0. PMID 24586036. ^ Pride DT, Salzman J, Relman DA (September 2012). “Comparisons of clustered regularly interspaced short palindromic repeats and viromes in human saliva reveal bacterial adaptations to salivary viruses”. Environmental Microbiology. 14 (9): 2564–76. doi:10.1111/j.1462-2920.2012.02775.x. PMC 3424356. PMID 22583485. ^ Held NL, Herrera A, Whitaker RJ (November 2013). “Reassortment of CRISPR repeat-spacer loci in Sulfolobus islandicus”. Environmental Microbiology. 15 (11): 3065–76. doi:10.1111/1462-2920.12146. PMID 23701169. ^ Held NL, Herrera A, Cadillo-Quiroz H, Whitaker RJ (September 2010). “CRISPR associated diversity within a population of Sulfolobus islandicus”. PLOS One. 5 (9): e12988. Bibcode:2010PLoSO…512988H. doi:10.1371/journal.pone.0012988. PMC 2946923. PMID 20927396. ^ Skennerton CT, Imelfort M, Tyson GW (May 2013). “Crass: identification and reconstruction of CRISPR from unassembled metagenomic data”. Nucleic Acids Research. 41 (10): e105. doi:10.1093/nar/gkt183. PMC 3664793. PMID 23511966. ^ Stern A, Mick E, Tirosh I, Sagy O, Sorek R (October 2012). “CRISPR targeting reveals a reservoir of common phages associated with the human gut microbiome”. Genome Research. 22 (10): 1985–94. doi:10.1101/gr.138297.112. PMC 3460193. PMID 22732228. ^ Novick RP, Christie GE, Penadés JR (August 2010). “The phage-related chromosomal islands of Gram-positive bacteria”. Nature Reviews Microbiology. 8 (8): 541–51. doi:10.1038/nrmicro2393. PMC 3522866. PMID 20634809. ^ Ram G, Chen J, Kumar K, Ross HF, Ubeda C, Damle PK, Lane KD, Penadés JR, Christie GE, Novick RP (October 2012). “Staphylococcal pathogenicity island interference with helper phage reproduction is a paradigm of molecular parasitism”. Proceedings of the National Academy of Sciences of the United States of America. 109 (40): 16300–5. doi:10.1073/pnas.1204615109. PMC 3479557. PMID 22991467. ^ Ram G, Chen J, Ross HF, Novick RP (October 2014). “Precisely modulated pathogenicity island interference with late phage gene transcription”. Proceedings of the National Academy of Sciences of the United States of America. 111 (40): 14536–41. doi:10.1073/pnas.1406749111. PMC 4209980. PMID 25246539. ^ Seed KD, Lazinski DW, Calderwood SB, Camilli A (February 2013). “A bacteriophage encodes its own CRISPR/Cas adaptive response to evade host innate immunity”. Nature. 494 (7438): 489–91. Bibcode:2013Natur.494..489S. doi:10.1038/nature11927. PMC 3587790. PMID 23446421. ^ Doudna JA, Charpentier E (November 2014). “Genome editing. The new frontier of genome engineering with CRISPR-Cas9”. Science. 346 (6213): 1258096. doi:10.1126/science.1258096. PMID 25430774. ^ a b Ledford H (June 2015). “CRISPR, the disruptor”. Nature. 522 (7554): 20–4. Bibcode:2015Natur.522…20L. doi:10.1038/522020a. PMID 26040877. ^ Alphey L (2016). “Can CRISPR-Cas9 gene drives curb malaria?”. Nature Biotechnology. 34 (2): 149–50. doi:10.1038/nbt.3473. PMID 26849518. ^ Ledford H (2017). “CRISPR studies muddy results of older gene research”. Nature. doi:10.1038/nature.2017.21763. Mohanraju P, Makarova KS, Zetsche B, Zhang F, Koonin EV, van der Oost J (August 2016). “Diverse evolutionary roots and mechanistic variations of the CRISPR-Cas systems”. Science. 353 (6299): aad5147. doi:10.1126/science.aad5147. PMID 27493190. Sander JD, Joung JK (April 2014). “CRISPR-Cas systems for editing, regulating and targeting genomes”. Nature Biotechnology. 32 (4): 347–55. doi:10.1038/nbt.2842. PMC 4022601. PMID 24584096. Slaymaker IM, Gao L, Zetsche B, Scott DA, Yan WX, Zhang F (January 2016). “Rationally engineered Cas9 nucleases with improved specificity”. Science. 351 (6268): 84–8. Bibcode:2016Sci…351…84S. doi:10.1126/science.aad5227. PMC 4714946. PMID 26628643. Terns RM, Terns MP (March 2014). “CRISPR-based technologies: prokaryotic defense weapons repurposed”. Trends in Genetics. 30 (3): 111–8. doi:10.1016/j.tig.2014.01.003. PMC 3981743. PMID 24555991. Westra ER, Buckling A, Fineran PC (May 2014). “CRISPR-Cas systems: beyond adaptive immunity”. Nature Reviews Microbiology. 12 (5): 317–26. doi:10.1038/nrmicro3241. PMID 24704746. Andersson AF, Banfield JF (May 2008). “Virus population dynamics and acquired virus resistance in natural microbial communities”. Science. 320 (5879): 1047–50. Bibcode:2008Sci…320.1047A. doi:10.1126/science.1157358. PMID 18497291. Hale C, Kleppe K, Terns RM, Terns MP (December 2008). “Prokaryotic silencing (psi)RNAs in Pyrococcus furiosus”. RNA. 14 (12): 2572–9. doi:10.1261/rna.1246808. PMC 2590957. PMID 18971321.
van der Ploeg JR (June 2009). “Analysis of CRISPR in Streptococcus mutans suggests frequent occurrence of acquired immunity against infection by M102-like bacteriophages”. Microbiology. 155 (Pt 6): 1966–76. doi:10.1099/mic.0.027508-0. PMID 19383692.
van der Oost J, Brouns SJ (November 2009). “RNAi: prokaryotes get in on the act”. Cell. 139 (5): 863–5. doi:10.1016/j.cell.2009.11.018. PMID 19945373. Karginov FV, Hannon GJ (January 2010). “The CRISPR system: small RNA-guided defense in bacteria and archaea”. Molecular Cell. 37 (1): 7–19. doi:10.1016/j.molcel.2009.12.033. PMC 2819186. PMID 20129051. Pul U, Wurm R, Arslan Z, Geissen R, Hofmann N, Wagner R (March 2010). “Identification and characterization of E. coli CRISPR-cas promoters and their silencing by H-NS”. Molecular Microbiology. 75 (6): 1495–512. doi:10.1111/j.1365-2958.2010.07073.x. PMID 20132443. Díez-Villaseñor C, Almendros C, García-Martínez J, Mojica FJ (May 2010). “Diversity of CRISPR loci in Escherichia coli“. Microbiology. 156 (Pt 5): 1351–61. doi:10.1099/mic.0.036046-0. PMID 20133361. Deveau H, Garneau JE, Moineau S (2010). “CRISPR/Cas system and its role in phage-bacteria interactions”. Annual Review of Microbiology. 64: 475–93. doi:10.1146/annurev.micro.112408.134123. PMID 20528693. Koonin EV, Makarova KS (December 2009). “CRISPR-Cas: an adaptive immunity system in prokaryotes”. F1000 Biology Reports. 1: 95. doi:10.3410/B1-95. PMC 2884157. PMID 20556198. “The age of the red pen”. The Economist. August 22, 2015. ISSN 0013-0613. Retrieved 2015-08-25.